Do you have a Labrador that is starting to age? If so, it’s important for you to start taking your dog to the veterinarian more often. While annual checkups are just fine for puppies and younger dogs, senior Labradors should make it to the vet at least once every six months. This will allow the vet to examine the dog thoroughly and spot any potential problems before they spiral out of control. There are several steps that owners can take to help care for your aging Labrador. Feeding your dog food made for seniors. Many dog owners don’t realize that there are dog foods made specifically for senior dogs. Most of the bigger brands make them in the same flavors available to younger dogs. When your Labrador starts aging, you should switch them over to these types of food. You might want to ask your vet if there is one particular food that would be best for an older dog if you aren’t sure what to buy. Keep an eye on your dog’s weight. Labradors are known for putting on a lot of weight when they get older. They don’t get as much exercise as they used to so they often get to be obese before long. If your dog can still handle walks and playing outside, try to get in as much exercise as you can, within reason. And if your dog can’t walk like it used to, speak with your vet about cutting back on the amount of food you give it so that it doesn’t put on too much weight. Play with your dog to keep its mind sharp. The mental well-being of your aging Labrador is very important. Even if your dog can’t be as physical as it used to be, it can still play games with you and learn new tricks. That’s right—you actually can teach an old dog new tricks! That is, if you’re prepared to put in the time to challenge your Labrador. You will be helping your dog out immensely when you find creative ways to improve its mental health. 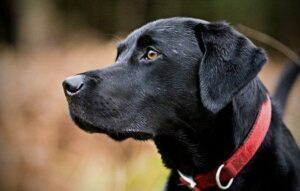 At KT British Labs, we love to see dog owners doing what’s best for their aging Labradors. We also love providing people with Labrador puppies, whether you are looking for an amazing pet for your family or a skilled hunting partner. Call us at 218-685-5103 today to learn how to obtain a puppy from one of our upcoming litters.